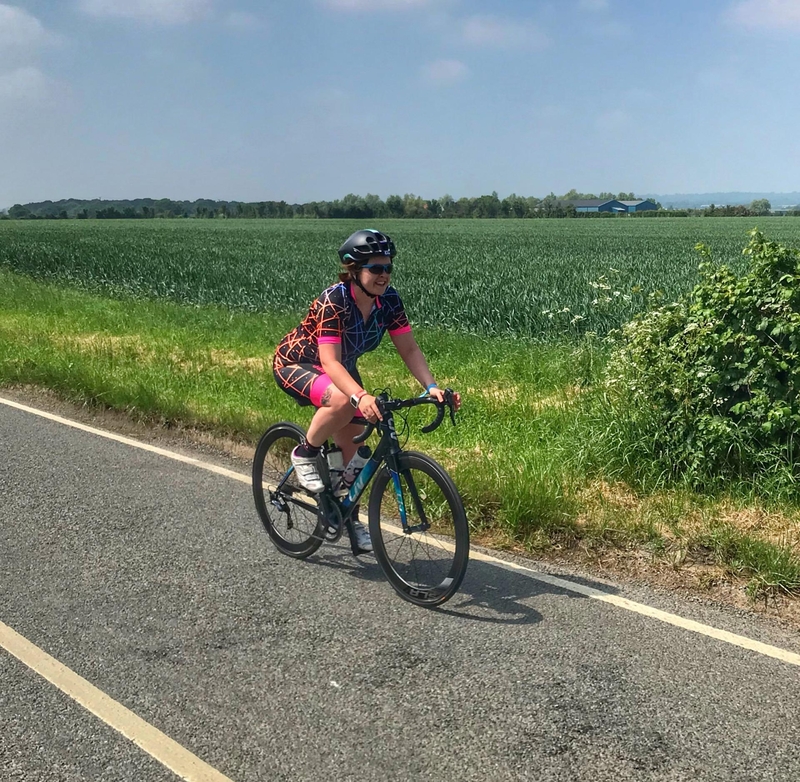 I’ve been spending more and more time on the saddle lately, whether it is on my road bike in training for my next triathlon, or a spin bike in preparation for the opening of Cycle Rhythm. 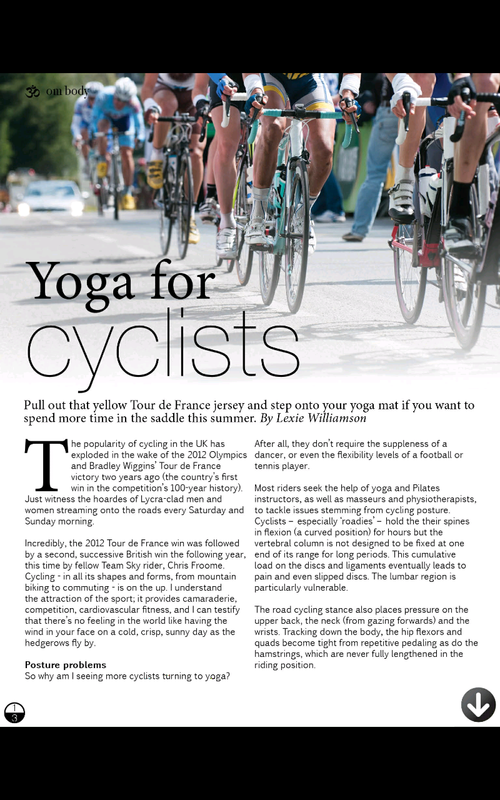 I’ve been noticing a lot of tension across my shoulders, neck and back due to the cycling posture, so I was interested to read an article in the latest issue of Om Yoga Magazine on yoga for cyclists. Yoga is the perfect way to redress postural imbalances in the body stemming from lengthy rides in the flexed posture that cycling usually requires. There are many ways yoga can enhance cycling performance, including creating a more aerodynamic riding stance, forging long, light muscles and improving core strength. 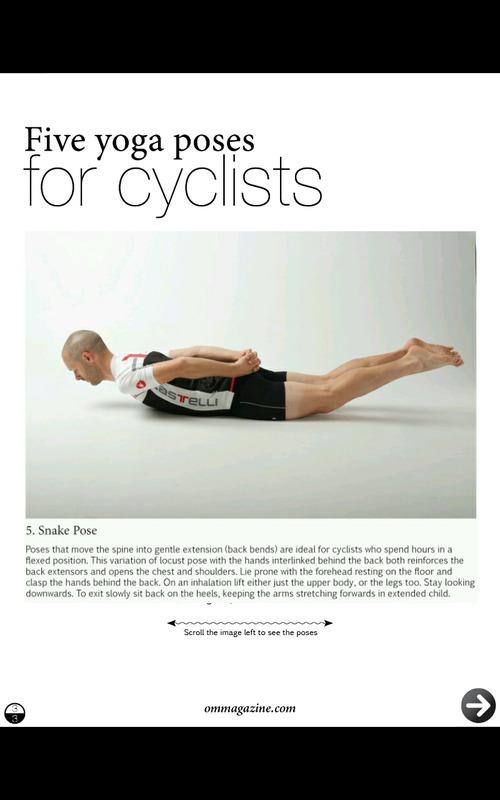 Included in the Om Yoga article are suggestions for five poses which stretch and lengthen muscles used in cycling- I’ve been practicing these poses after an intense spin class or a outing on my bike. These poses really work to open up the chest and shoulders, lengthen the spine and realign the shoulders- I’ve found them really beneficial to ease out any aches. Snake pose feels particularly good for restoring balance in my shoulders and chest. Om Yoga magazine is packed with articles like this one on how yoga can complement other sports or training. If you would like to read more, you can download a copy of the magazine here. The current edition is a double issue covering July and August, so there is plenty to read!